At Parkview Dental, we are committed to focusing on your dental hygiene and overall oral health. This means decreasing inflammation through periodontal care. When you have active periodontal disease, the typical routines of home maintenance — including daily dental hygiene and teeth brushing — may not be effective enough, as those methods generally focus on areas of the tooth that are above the gum-line. But with regular scaling and root planing procedures, we can remove the build-up of plaque, tartar (calculus) and bacterial toxins (biofilms) from tooth surfaces below the gum line, which are the areas that general home care practices are unable to reach. At Parkview Dental, we make sure that you are on a twice-per-year — or possibly more, depending on your own individual health needs — frequency of maintenance and/or preventative care schedule. In order to find appointment times that fit with busy and active lifestyles, most of our client’s pre-schedule their next visit with us. We will remind you with either a phone call or by e-mail when it is time for your next preventative care visit. It is important to know that Gum Disease — clinically known as Periodontitis — can take many forms. Each form presents us with different levels of severity. If left untreated, severe periodontitis can eventually lead to tooth loss and other potential health problems. The most common form of periodontal disease is called ‘Gingivitis.’ Gingivitis causes your gums to become red and swollen. Because of this, they may also tend to bleed easily. However, at this stage of progression, you may only be experiencing little or even no discomfort. Gingivitis is usually caused by an inadequate oral hygiene regimen. It is usually reversible with professional treatment and good oral hygiene habits such as regular brushing and flossing. Periodontitis is the advanced form of Gingivitis. Periodontitis occurs when gingivitis is left untreated. The gingivitis then advances to the point where the plaque spreads below the gum line. This causes the invading bacteria to produce toxins and plaque which irritate the gums themselves. The body reacts by producing an inflammatory response. This causes the body to turn on itself essentially. If Periodontitis is left untreated, the end result is that the tissues supporting the bone — and therefore the teeth themselves — are broken down and destroyed by the bacteria and toxins. The bacteria and toxins cause your gum tissues to separate from the teeth and form what are known as ‘pockets.’ These pockets are essentially spaces between the teeth and gums that have become infected. As the periodontitis progresses, these pockets deepen such that more gum and bone tissue is destroyed. Your teeth may eventually become loose and may even have to be removed as there is literally no longer any bone structure remaining to hold them in place. What are the Signs & Symptoms of Periodontitis? Are your gums red, puffy, swollen or tender? Do your gums bleed during brushing or flossing? Do your teeth look longer because your gums are receding? Have your gums separated or pulled away from your teeth, creating a pocket? Do you have changes in the way your teeth fit together when you bite? Is there pus coming from between your teeth and gums? Do you have constant bad breath or a bad taste in your mouth? Do your teeth have a lot of plaque on them? Do you have a lot of tartar on your teeth? Q) How Do I Tell if I Have Healthy Gums? A) If you have healthy gums, the gums are firm and don’t bleed when either brushing or flossing. You will notice that your gums fit snugly around your teeth. Q) How Do I Know If I Have the Start of Periodontal Disease? A) When you have the mildest form of Gingivitis (periodontal disease), the gums may appear mildly inflamed or appear red or swollen. 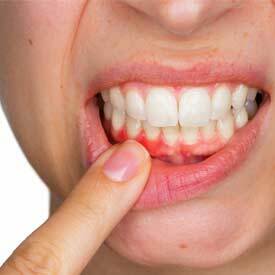 If your gums bleed when brushing, this is also a major sign that you have periodontal disease. Periodontitis is when your gums have begun to separate and recede from the teeth. This allows the plaque to move towards the roots, which function as the support mechanism to fibers and bone. When you have advanced periodontitis, the supporting fibers and bones are decayed. This can end up causing your teeth to become loose and may even result in the need for their removal! By booking regular teeth cleaning and oral health checks for periodontal care, we can help you stay on a path towards a lifetime of oral health! Q) How do you Treat Periodontal Disease? Scaling – Scaling removes tartar and bacteria from your tooth surfaces and beneath your gums. It may be performed using instruments or an ultrasonic device. Root planing – Root planing smoothes the root surfaces, discouraging the further buildup of tartar and bacterial endotoxin. Antibiotics – Your Parkview Dental Dentist may recommend using topical or oral antibiotics to help control bacterial infection. Topical antibiotics can include antibiotic mouth rinses or insertion of gels containing antibiotics into the space between your teeth and gums or directly into the pockets after a deep cleaning. The use of oral antibiotics may be necessary to eliminate infection-causing bacteria completely. If you think you are experiencing Periodontal Disease, contact us today to book your periodontal care appointment. We look forward to answering your dental questions and to helping you and your family with all of your dental health needs.